Bomber-style jacket design with classic waterproof/breathable 50 gram non-woven polypropylene material. Features a raglan design action cut sleeve that offers larger arm openings for easy on and off and more mobility. New sleeve design also eliminates seams on shoulders and other stress points. Storm flap with nickel-plated spring snaps that won't rust. 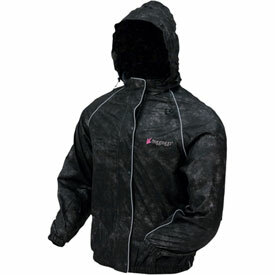 Full-cut designed for active use and designed to be worn over insulated clothing.